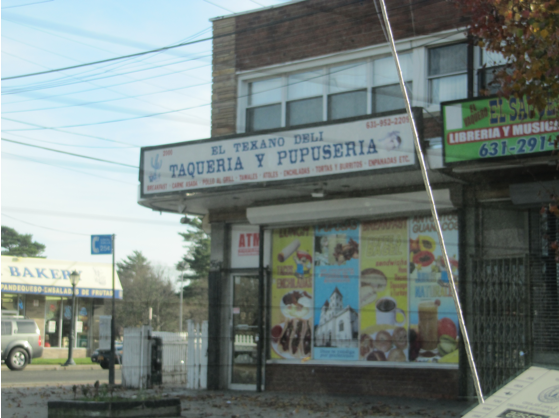 Behold El Texano Deli, where English is sparse and gringoes non-existant. That is until we hit it up hard for lunch today after a trip to Island Thrift. I'd like to say I've been scoping this place out since I was a child in the womb, but I think it's really just been since I developed a fancy for White Castle which is across the street. Ed and I went armed with Spanish menu ordering phrases prepared and practiced, but what came out was really more like spanglish I'd say. The woman helping us set the tone by speaking to us in English, but I still threw a few words in there like a tool. Confronted with a long hot table filled with lots of beautiful food, we were timid at first and ordered two tacos each of carne asada, carnitas and pollo. We also asked for two pupusas. While we were waiting I noticed that everyone in the know was ordering this yellow soup that had mussels, clams, half-crabs and fish floating around in it. A small order of that, por favor. 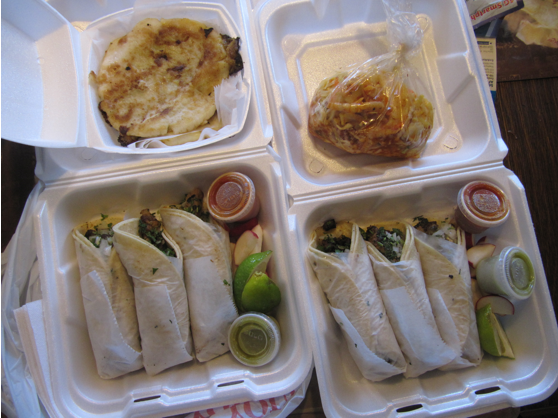 $24 and about ten minutes later we shipped out and headed home with our fragrant styrofoam platters of perfection. I was nervous in the store that the tacos may be lacking on toppings because I only saw onions being added, but at home we found a bag of seasoned cabbage slaw just begging to get involved. This was to prevent sogg from occurring on the journey; how thoughtful. We liked the salty and moist steak taco the best and I think the crisp (and sometimes weirdly crunchy) carnitas came in second. The chicken lacked excitement, but we only ordered it because they said they had no chorizo. Guess JG will remain my chorizo mainstay. What is a pupusa? Wikipedia just told me that it is a Salvadoran patty made from corn flower and usually filled with a blend of cheese, pork and refried beans. These were really tasty but quite greasy. El Texano offered to add more cheese, meat and/or beans to them, but I think they were perfect in this natural state. I've saved the most interesting for last. 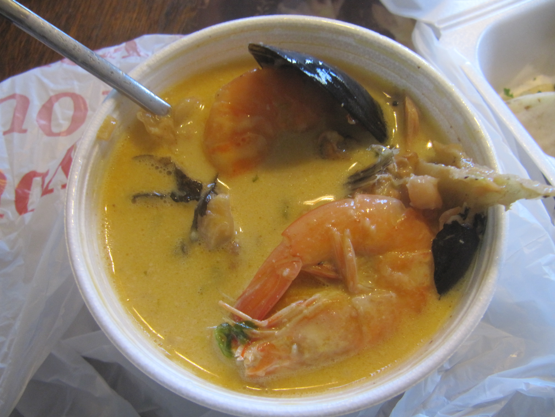 This sopa mariscada was quite the treat. I saw men eating it in the store with piles of shells and bones building up on their plates, so I knew I was in for some work with this. The broth was thin but full of flavor that would so necessarily come from a slow stewing of sea creatures in their entireties. I found bones and gills and maybe even worse, but also mussels and clams and fish meat. Just don't look too closely at what's in your spoon. I didn't bother working for the shrimp but they were there, heads and all. Something about the broth was distinctly familiar and I would venture to guess that there may have been a coconut milk involved. I couldn't bring myself to eat through the soup indiscriminately, but I'm definitely glad I tried what everyone else was going after. The moral of the story is -- everything tastes better when it is authentic enough for the knowledgable to eat it. 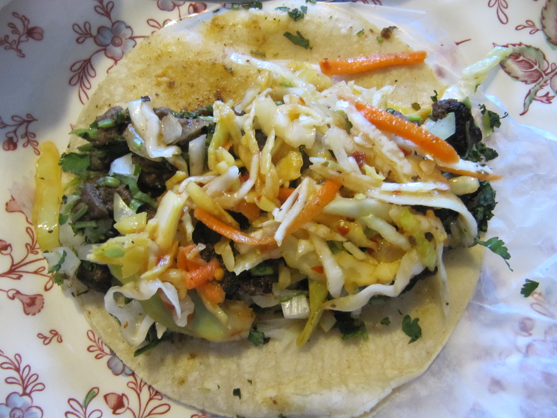 El Texano has good food and even better culture, so go with it. There was much more to try there, so I'll definitely be back.